omid (mashhad, Iran) on 13 September 2018 in Landscape & Rural and Portfolio. Beautiful atmosphere ! I like it a lot ! A very soft and beautiful autumn photo! I love the mist! Looks like it arrived. We are still green here, but the days are cooler so colours are coming. Une ligne courbe et claire qui fait plonger le regard dans l'épaisseur du mystère! I love the sense of mystery with this image. Your title is perfect and the image een more so - congratulations! Misty twisty, could be UK right now. Beautiful, i like a lot this misty atmosphere . Excellent image of the fog creeping down. Waiting for autumn or going towards an unknown future ! 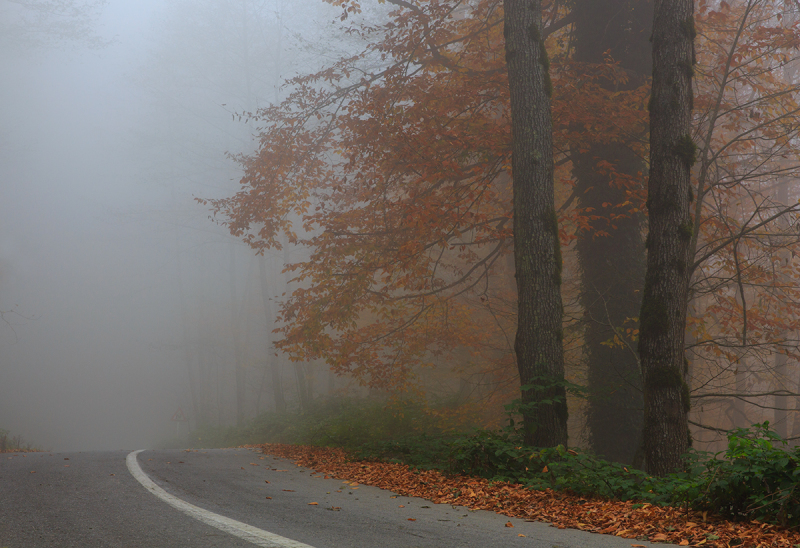 Great misty atmosphere to accommodate these autumnal colors! Beautiful atmosphere in a nice composition. A very attractive curving road into the fog. Autumn is here for sure. I like the mood of this photo. Good atmosphere and great hint of autumn colours hiding in the fog. .....and other nice colours .......Love the mood of this picture,Friend .